Sublance technology was developed from the start of the 1980’s and was originally born to improve process control in the relatively complex BOF process. Because of improved control basic efficiencies can be improved as well as some quite dramatic increases in specific equipment life spans. A Basic Oxygen Furnace (BOF) consists of a series of complex processes with hazardous features, for example because of the high temperature, dust and vibration. There are many chemical reactions and physical phenomena within a BOF, which are not fully understood by the users. It is difficult to get direct measurements from the vessel. Therefore, indirect measurements and models are often used to predict the status in the vessel. The models are not precise because of the limited amount of measurements and the complex and unknown interactions between the variables. 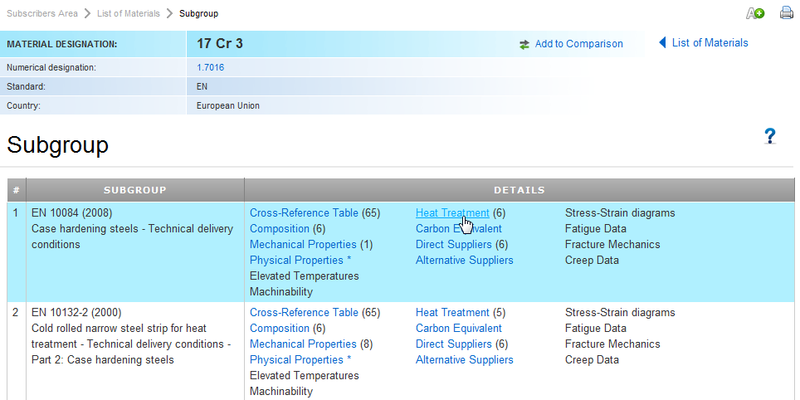 The final two decades of the 20th century saw the birth of sublance-based process control for BOF steelmaking plants. As this method gained acceptance and became standard practice in most of the world, BOF process control systems were also developed to offer new measurement possibilities, process monitoring tools and increased levels of process automation. Since basic oxygen steelmaking is a rapid and complex process, good process control is essential to achieving high plant output and quality, and in minimizing costs. 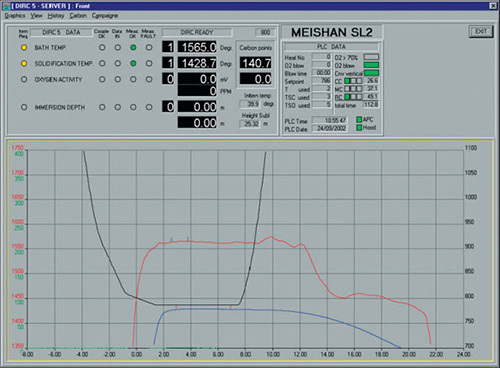 Many improvements to measurement techniques and process monitoring tools have been made over recent decades. The amount of process-related information currently available to the operator, both online and at intervals, enables the highest hitting rates and substantially reduced tap-to tap times for maximum plant output to be achieved, as well as cost reduction through optimized use of converter additions, scrap, etc. Sublance equipment facilitates fully automated sample taking and measurements without tilting the vessel or interrupting the blow. 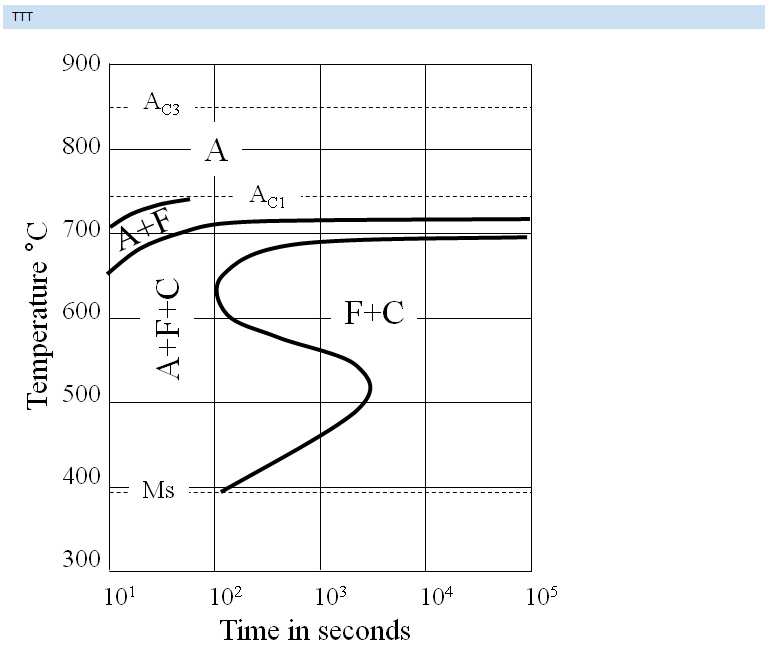 Two cycles for sample taking and measuring are scheduled per heat: one during the main blow (typically after 90% of predicted oxygen has been blown), the other after the blow end. The in-blow measurement, using a TSC (Temperature, Sample, Carbon) type probe serves to update the required amounts of oxygen to be blown and additives such as coolants, in order to meet the carbon content and temperature endpoint requirements of the steel. 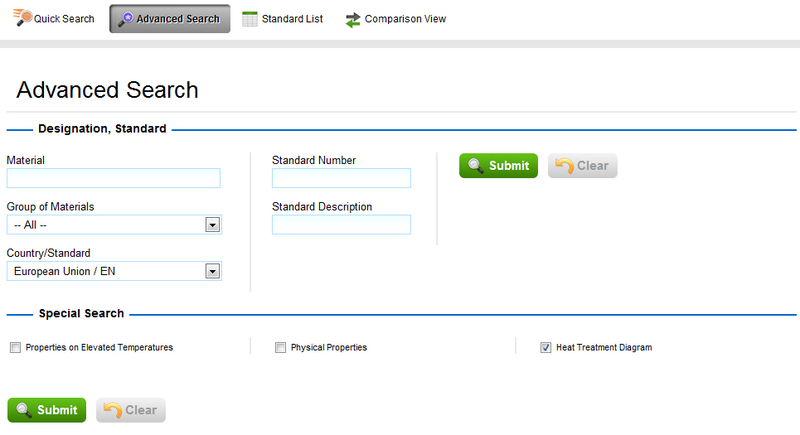 These updated blow requirements are generated by the SDM on receipt of sample data. Oxygen flow rate is reduced slightly during measurement to improve reliability of the measurement. 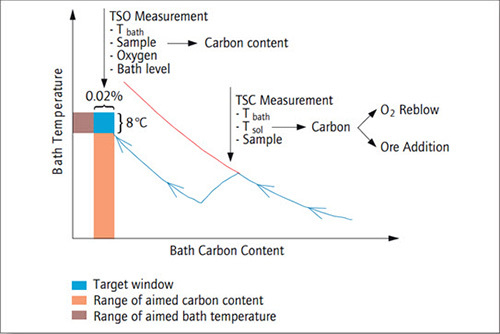 At the end of the corrected oxygen blow, steel bath temperature and free oxygen content are measured using a TSO (Temperature, Sample, Oxygen) type probe to determine the final carbon content and calculate the steel bath level. (Bath level is used to ensure the correct lance height is employed during blowing). During both cycles, samples are recovered automatically from the spent probe and delivered in a probe collecting chute at the control room elevation to be analyzed for the projection of end point composition. 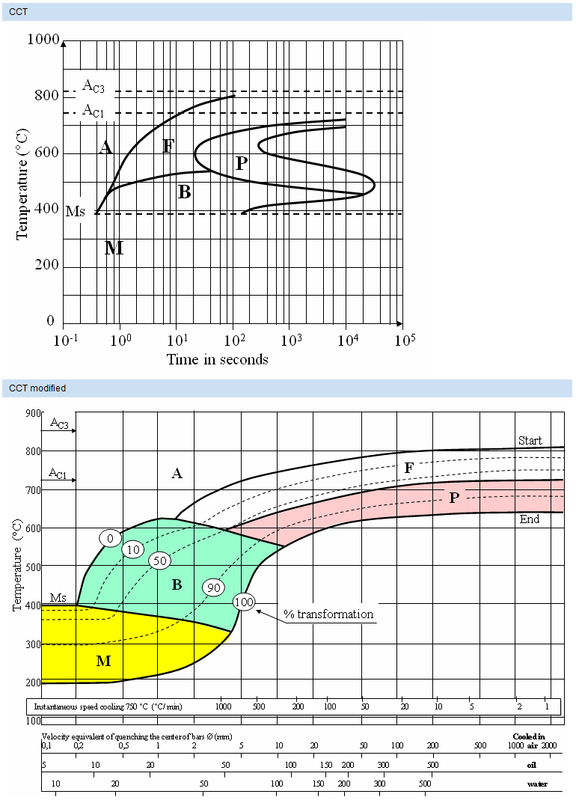 Figure 1 illustrates the process control concept with respect to changes in temperature and carbon content. Figure 2 shows a typical screen ouput. 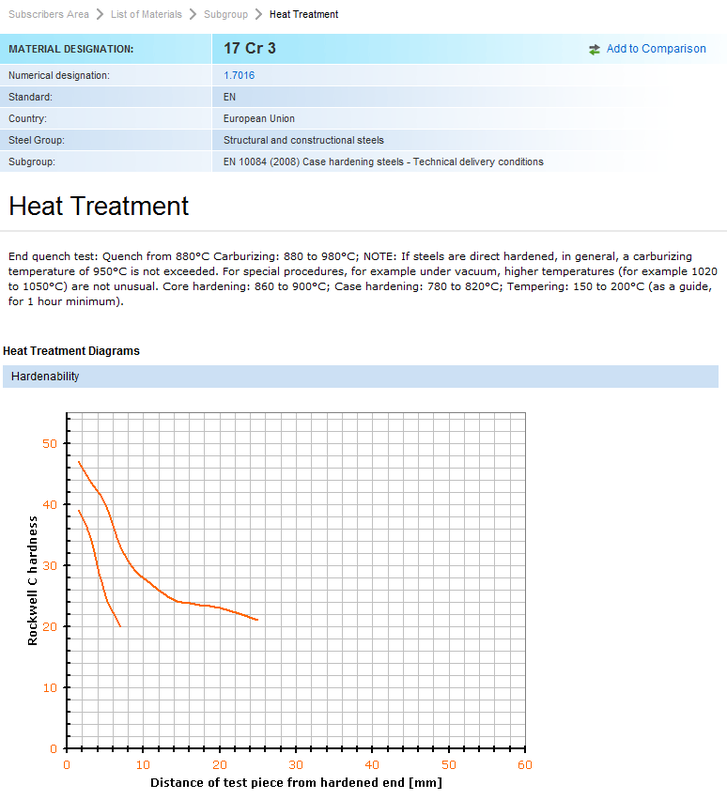 The black line indicates lance position, the red line shows the bath temperature and the blue line shows the solidification temperature. The sublance system has provided valuable information for the process model to reach the final target without a re-blow. At this time about 175 sublance systems have been installed worldwide. Modern BOF vessels run their sublance combined to a Static Dynamic process control Model (SDM). Sublance and SDM united, provide a substantial reduction in Tap-to-Tap time resulting in a higher production rate and simultaneously reduced refractory cost. Danieli Corus, supplying sublance systems, recently even reported a 25% rise in production capacity coinciding with 17% reduced BOF cycle time at an integrated Brazilian shop with their newly installed sublance system. The vessel’s lining life was increased by a remarkable 41% at the same time. In contrast to an off-gas mass spectrometer controlled vessel, the sublance system offers the chance to correct temperature and chemistry uninterrupted about 2 minutes prior to oxygen stop. Together, sublance and SMD have been providing the best chances for a very high targeted hit rate for carbon and temperature without re-blows. Diagramas de tratamento térmico estão disponíveis para um grande número de matérias no banco de dados da Total Materia. Diagramas de tratamento térmico abrangendo temperabilidade têmpera dureza, TTT e CCT podem ser encontrados no conjunto de dados padrão. Para selecionar materiais por propriedades especiais, você pode usar as caixas de seleção especiais de busca no módulo de Pesquisa Avançada. Para definir os critérios de pesquisa, tudo que você tem a fazer é selecionar o país / padrão do seu interesse a partir do "País / Standard 'lista pop-up e para a caixa de verificação' Diagrama de Tratamento Térmico", situado na área de Pesquisa Especial do formar-se na parte inferior da página de pesquisa avançada. Depois de selecionar o material de seu interesse, clique no link Tratamento Térmico para visualizar os dados para o material selecionado. O número de registos de tratamento térmico é apresentado entre parêntesis ao lado da ligação. Todas as informações disponíveis de tratamento de calor será exibida para o material escolhido.